Tous égaux, les élèves québécois? Pas du tout. De récentes données sur le décrochage scolaire et le taux d’obtention de diplômes consultées par La Presse révèlent un véritable fossé entre certaines régions, alors qu’une profonde faille divise l’île de Montréal en deux univers à des années-lumière l’un de l’autre. Les adolescents qui vont à l’école à l’est du boulevard Décarie ont jusqu’à deux fois moins de chances de terminer leur secondaire avec un diplôme en poche que ceux qui vivent dans l’ouest de Montréal. Il existe bien deux solitudes dans la métropole. Une analyse réalisée par le professeur Michel Perron, titulaire de la Chaire de recherche sur les conditions de vie, la santé et les aspirations des jeunes de l’Université du Québec à Chicoutimi, dévoile une véritable cassure séparant les écoles des deux moitiés de l’île. «On voit très bien le clivage», note le chercheur. 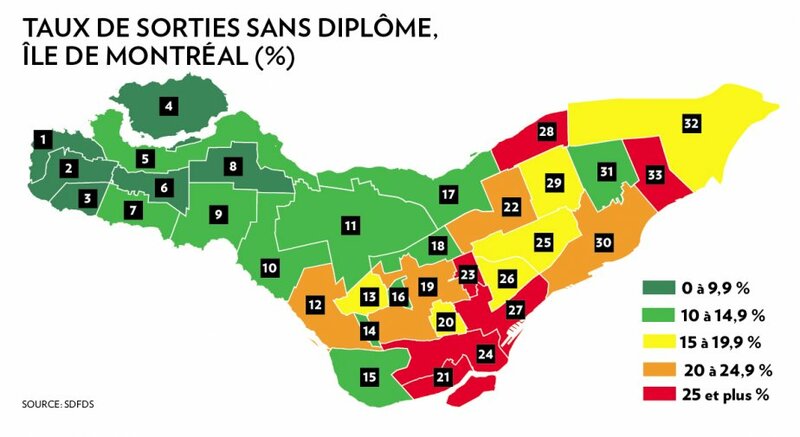 À l’ouest, entre Senneville et LaSalle, 15 arrondissements sur 17 affichent un taux de décrochage de moins de 15%, loin sous la moyenne québécoise. À l’est, de Côte-des-Neiges à Pointe-aux-Trembles, seul un arrondissement affiche un score aussi enviable. Les 14 autres ont des taux de sortie sans diplôme des jeunes au secondaire qui oscillent entre 15% et plus de 25%. Pourquoi? Les pistes sont nombreuses. Where are the reductions in class sizes that we were promised? When the Quebec government makes a commitment to reduce class size, should school boards have the ability to subvert such commitments in order to protect their bottom line? This question is at the heart of a grievance filed recently by the Pearson Teachers Union (PTU) against the Lester B Pearson school board. In the context of its last round of negotiations with the province’s teachers, the government of Quebec offered to make significant reductions to the maximum size of most classes in Quebec’s public schools. 4. Classes in economically disadvantaged neighbourhoods would be reduced by as many as 9 students. This offer by government came as a welcome surprise to teachers and their unions. Most teachers have experienced the difference between a class of 26 and one of 30 and know the enormous impact a few additional students can have. Smaller groups allow teachers to make connections with each of their students and keep them all on track. Conversely, in larger groups students feel more anonymous and are hence more likely to act out or withdraw. In other words, larger groups force teachers to focus more on behaviour and discipline, while smaller groups allow us to focus on what we love, teaching. But reducing class size is not merely about improving the working conditions of teachers; more importantly it is about improving the quality of public education. Indeed the body of evidence documenting the benefits of class-size reductions is enormous, particularly with regard to reductions at the elementary level. Reducing class size has been shown to have lasting positive effects on academic achievement, absenteeism and drop-out rates. It has also been found to be one of the only factors capable of closing achievement gaps based on socio-economic status. In small classes, poor kids do just as well as rich kids. Class-size reductions have even been found to have long-term public health benefits. With so many potential benefits, it is not only teachers that should be concerned that classes in Quebec’s large English school boards do not seem to be getting any smaller. This is particularly true in a context where English school boards have been losing numbers to their French counterparts and the private sector. Ensuring that class size reductions are properly implemented ensures that the quality of education in English public schools is not merely protected, but improved. School boards are able to avoid implementing class-size reductions by exploiting a clause in the teachers’ collective agreement which they claim allows them to pay teachers a tiny amount of compensation for oversized classes. It is this interpretation that is being challenged by the PTU, which contends that the collective agreement only permits oversized classes in very specific circumstances, none of which apply to large urban schools. 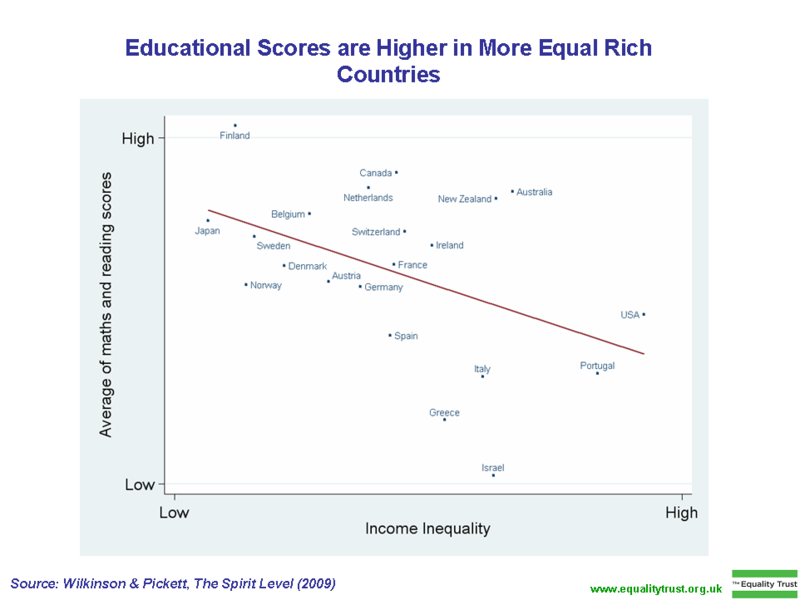 Education and the 2012 Quebec Election: Part Eight – Where do the Parties Stand on Inequality? Thus far this series has looked at where Quebec’s political parties stand on education funding, curriculum reform, school autonomy ,the abolition of school boards , reducing the dropout rate, private school subsidies and respect for teachers. This the eighth and final article in the series will examine where the parties stand on an issue that, although seemingly less directly connected to education than the issues examined thus far in this series, has far greater implications for students, teachers and indeed Quebec’s educational success as a whole. That issue is inequality. Back in 2009 a book was published that fundamentally changed the way many think about issues of economic and social development. It was entitled The Spirit Level and it represented a fundamental challenge to the notion that the well-being of a country’s citizens is first and foremost a product of its wealth. In comparing the international data on life expectancy, the book’s authors, who are both epidemiologists, observed that while indeed wealth was correlated with life expectancy in the early stages of a country’s economic development, once a certain basic level of development was achieved the correlations with wealth seemed to disappear. Instead what they observed amongst developed countries was that life expectancy was correlated not with a country’s wealth but with its level of economic inequality; people in countries with less economic inequality lived longer than those in more unequal countries, even if the overall wealth of the unequal countries was greater. They then noticed that this pattern applied not just to life expectancy but to just about every statistical indicator of a society’s well being that they could find. In presenting this vast array of data, the book provides extremely compelling objective evidence of something that many have known intuitively for some time: societies with more economic equality tend to be happier, healthier, better educated and more prosperous. If there is a take-away message from this book for voters at election time, it is that there is not a more urgent and important issue for our political leaders than that of creating a more equal society. The Spirit Level’s implications for education warrant special attention. Not only does it show that traditional indicators of a country’s educational success, such as achievement and graduation rates, are correlated with greater equality, it also shows a number of other indicators that are less directly related to education to be as well. Consider the effects that each of the following factors can have on the daily lives of education workers and the overall success of Quebec’s students: mental illness, alcohol and drug abuse, teenage births, obesity, homicide, imprisonment, trust, optimism, social mobility, bullying, childhood conflict. Each and every one of these factors is correlated with equality. 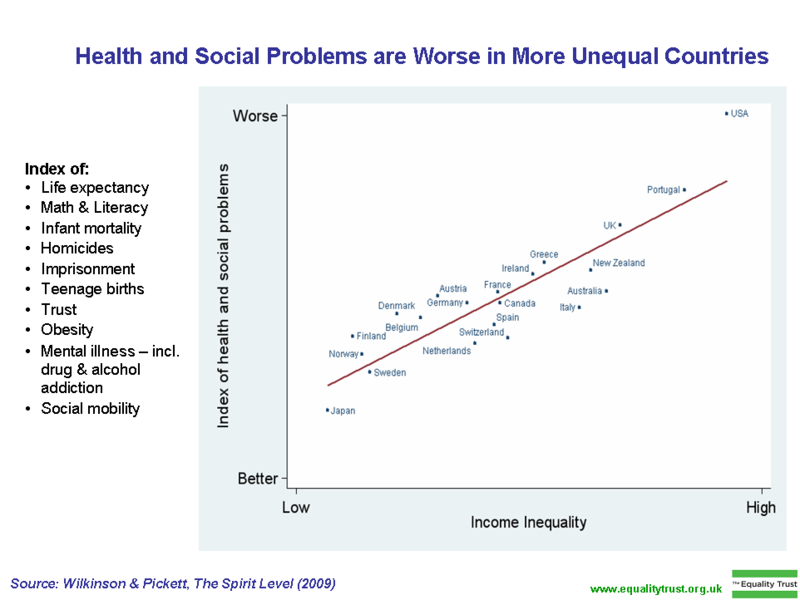 Countries that are more equal show more positive results in each factor. The inescapable conclusion is that there is perhaps no more important priority for improving Quebec’s educational outcomes than reducing its level of economic inequality. So how has Quebec society been doing in recent years in terms of its level of inequality? A 2010 study jointly produced by the Canadian Centre for Policy Alternatives (CCPA) and L’Institut de recherche et d’informations socio-économiques (IRIS) sought to examine this very question. Although the study indicates that thanks to the historically high level of government intervention in Quebec, inequality is less of a problem in Quebec than it is in the rest of Canada, it also points to a disturbing trend of growing inequality in Quebec. The study examines the period between 1976 and 2006, noting that inequality had grown steadily in Quebec during this period, reaching a 30 year high in 2006. “Quebeckers worked more and the province’s economy grew by 71% during this period but not all Quebec families enjoyed the benefits,” says IRIS co-author Bertrand Schepper. “The lion’s share of income gains went to the richest 10%, while the majority of Quebec families – the bottom 70% — ended up with a smaller share of the income pie.” According to the data presented in this study, the sharpest growth in inequality occurred in the period since 1996. Education and the 2012 Quebec Election: Part Five – How are the Parties Proposing to Lower Quebec’s Dropout Rate? Thus far this series has looked at where Quebec’s political parties stand on education funding, curriculum reform, school autonomy and the abolition of school boards. This article will examine how each of the parties proposes to lower Quebec’s high school dropout rate. The alarmingly high dropout rate has been Quebec’s perennial education issue for at least the last twenty years. It seems every year or so a new set of statistics emerges documenting, yet again, that no significant progress has been made to reduce the chronically high number of dropouts. This begins the public hand wringing by Quebec’s political class and is usually followed a few months later by some poorly funded government half-measure, announced to great fanfare. A year or so later another set of statistics emerges and so the cycle begins again. There are many political issues in Quebec that have a tendency to provoke cynicism. This is certainly one of them. Clearly this is a problem that cannot be solved by half measures. Although not all the factors affecting dropout rates are within government control, governments are far from powerless in affecting significant reductions. 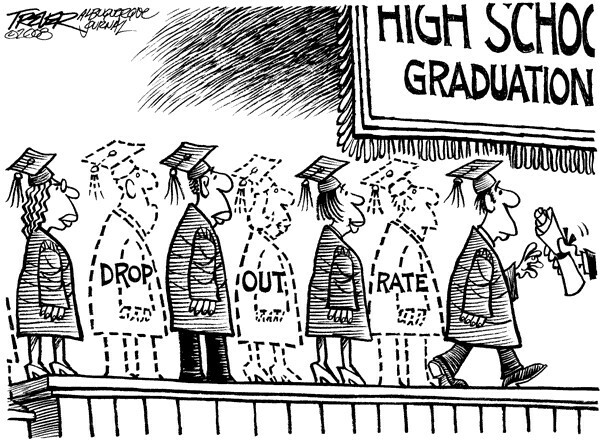 Numerous measures that are within government control have been identified as contributing to reducing dropout rates. Such factors include: class size; the availability of extra-curricular activities; the existence of programs to counter homophobia, racism, bullying and intimidation; the severity of school discipline codes; the availability of psychologists, drug counsellors, social workers, and other professional support staff. The avenues for government to explore to solve this problem are many; the problem is not a lack of options, it is a lack of political will.